1. This paper estimates the contribution of international migration to the increase in the number of households in the UK since 1992. It uses data from the Labour Force Surveys to estimate the change over time in the proportion of households headed by persons born outside the United Kingdom. It concludes that 65% of UK household growth from 1996 to 2014 was the direct consequence of international migration to the UK. That will have had a significant impact on the demand for housing. Between 2010 and 2014, households headed by persons born in the UK increased by 32,000 per year on average; households headed by persons born outside the UK by 115,000 or 78%. On present trends immigration will continue to be a major factor in housing demand. 2. International migration is now the chief driver of population growth in the UK. This is relatively new. In most years until the late 1980s net migration was negative. But from 1991 to 2001 net international migration rose to account directly for 44 percent of the increase in the population of the UK and by 2001-2013 for 56 percent. This figure takes no account of the children of immigrants born in the UK who are an important component of population growth. Population growth arises from net migration and from the excess of births over deaths (that is, the ‘natural increase’ of the population). Figure 1 shows the annual contribution to population growth in England and Wales from net migration, from births and deaths of people born in the UK and from the births and deaths to immigrants born outside the UK, from 1969 to 2012. Net migration has been the dominant component of population growth since about 1997 and the natural increase of the UK- born population of England and Wales has contributed the least. Figure 1. Contributions to population growth. Source: data from Office of National Statistics. 3. Growth in the number of households is driven by population growth, changes in the age-structure of the population, social changes including trends in cohabitation, marriage and divorce, and birth and death rates. Market forces, especially the housing market, play an important role. All of these, operating on each other in a circular fashion, influence the number of people living by themselves and in households of different sizes. For most of the 20th century the number of households rose faster than population growth, as average household size fell: in England and Wales from 4.32 persons in 1911 to 2.42 in 1991 (ONS 2011). Family size has declined and the proportion of one-person households has more than doubled since 1961. Households of three people or more have become relatively less frequent. 4. More recently, those social trends have slowed. Since the 1990s average household size has changed little (Holmans 2014, ONS 2011, 2014) and in recent years population growth has accounted for more and more of the increase in the number of households. From 2001 and 2011 single-person households increased less than expected, more middle and older-age persons lived in multi-person households. More young people continued to live with their parents. Marriage and union formation, and home ownership, have been delayed. Housing shortages, and housing costs, have contributed to these trends. The unusually large number of immigrants in recent years, although now dominating household formation, did not generate a proportionate increase in the number of households. Immigrants have had household formation rates initially lower, at any given age, than that of the population as a whole, because their household size tends to be larger (Holmans 2013). Basic data on household population and households from 1961 to 2011 for England and Wales are given in Table 1 (As noted above, data for England and Wales are often more readily available than for the UK). Household population and households, England and Wales 1961-2011. Source: ONS 2012 2011 Census - Population and Household Estimates for England and Wales, March 2011. Data from Figure 9, Number of household residents and households, 1911 – 2011. 16 July 2012. 5. Since the 1990s the increase in the number of households has mostly been due to population growth. 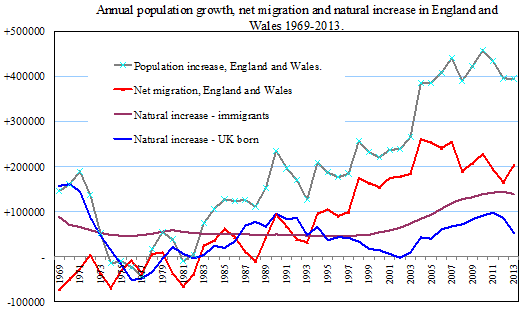 From being nearly zero in the 1980s, population growth in England and Wales has greatly increased, mostly through the contributions of international migration, directly through net migration and indirectly through the natural increase of the immigrant population (Figure 1). In the decade up to 2011, the household population grew by 3.96 million or 7.8%, the greatest increase ever (ONS 2012; Figures 1, 9 and 10) and the highest intercensal percentage growth since the 19th century. 6. Government statisticians have not analysed the relative quantitative roles of population growth, migration and of social trends in past and current household formation and there seems to be no prospect of their doing so (ONS reply to Parliamentary Question HL4978, February 2015). However, an academic analysis has shown that population increase alone accounted for 39% of the increase in households in England from 1961-1971, for 43% from 1971-81 and for 68% from 1981- 1991. That specific calculation is not available beyond 1991, but the combination of population increase and changes in age-structure and marital status together accounted for 68% of household growth from 1991 – 2001 and for 97% from 2001 to 2011 (Holmans 2014; table 1, page 3). And the author has commented that the 1990s has seen ‘a new era in household projections: near dominance by the migration assumption in the underlying population projection.’ (Holmans 2014, p.8). If household trends are considered just in one big step from 1971 to 2008 (Schmuecker 2010, p. 10) these important changes are obscured. 7. The powerful influence of international migration on population growth, over one half in most recent years, suggests that a substantial and increasing element of household growth in the UK must come from net migration. In the absence of official estimates on the role of migration in these trends, some light can be thrown on this issue by examining some direct data from the Labour Force Surveys on the relative proportion of new households with heads born within, and outside, the United Kingdom. 8. The Quarterly Labour Force Surveys (QLFS) and the earlier annual (initially biennial) Labour Force Surveys have been the chief source of regular official data on employment and personal circumstances in the UK since 1973. Held quarterly since 1992, each quarterly sample of 60,000 private households is spread over five successive quarters. Sample numbers of interviews are grossed up to national (UK) population totals by weighting procedures. The population numbers, not the sample numbers, are given in Table 2 below. 9. The QLFS is available in two forms of weighting. One is more suitable for the analysis of individual characteristics. There is also a twice-yearly household dataset, instituted in 1990, more suited to analysis at the level of the household. The annual April-June household datasets were used in this analysis. The sample size is very large: for example the 2014 April-June household dataset comprised 103,269 persons of whom 41,644 (40.3%) were ‘household reference persons (HRP)’ representing therefore 41,644 households. Those are grossed up to 26 million households for analysis at the UK level. The number of ‘household reference persons’ is very similar to the number of occupied dwellings. 10. Data from successive QLFS show in successive years the relative number of households identified as having a ‘household reference person (HRP)’ born respectively in the UK, and born outside the UK (Here, the terms ‘immigrant’ and ‘born outside the UK’ are used synonymously). Recent QLFS show that the majority of new households in the UK in each year now have an immigrant ‘household reference person’ (Table 2). From 1990 to 2014 the number of households in the UK increased by 4.1 million, for which information on country of birth is available for 4.0 million. Households with an immigrant reference person accounted for 2.1 million (53%) of that increase of four million households. 11. The immigrant share of household increase has grown further in more recent years following the upsurge of net migration from the late 1990s. Of the 2.7 million increase in all households from 1997 to 2014 (with information on country of birth), 1.8 million (65%) had an immigrant household reference person. Overall, in 2014 14% of UK households had an immigrant household reference person compared with 7% in 1990. The QLFS household dataset does not extend back before 1990. However the conventional person-level LFS before 1990 (which somewhat overstates the number of all households) shows that the proportion of households headed by immigrants had been roughly constant at 7-8 percent of all households during the 1980s. Note that these data from the Labour Force Surveys do not include the contribution of the children of immigrants born in the UK to household formation, only that of the immigrants themselves. The former information cannot be derived from QLFS data. 12. There is wide variation in the size of immigrant households but on average their average household size is greater and they are more likely to live in overcrowded conditions (see paragraph 17). So, person for person, immigrants have required less housing than the UK born. However, the data presented here relates directly to the number of households and thus completely takes that into account. For example, a house containing a large number of young Eastern Europeans is one household in the Labour Force Survey; as is one person living alone. Note: The figures for the total number o fhouseholds in column 2 differ slightly from the official figures given in the ONS Families and Households release of january 2015. In the latter the numbers are rounded to the nearest thousand and there are a small number of other minor discrepancies. 13. The table shows a relatively progressive but not perfectly smooth increase in the proportion of households headed by immigrants in successive years. If three-year averages are taken centered on 1992, 1997 and 2013 in order to smooth the variability, the headline figures cited above become 51 percent and 59 percent respectively. Data for the census years 2001 and 2011 are somewhat anomalous, each showing a big but transient increase in the apparent proportion of new households headed by immigrants. The reason for this is unknown, but those years both had an unusually large number of missing values for the variable ‘country of birth of the household reference person’: 1.4 million in 2001 and 3.2 million in 2011 (grossed up figures). In most years this would be about 100,000. 14. The data show a progressive increase, year by year, in the number of new households with household reference persons born outside the UK, and a diminution in the annual number of new households with a household reference person born in the UK. Numbers from one year to the next are rather irregular, in part because they are the differences between successive grossed-up samples. Table 3 below shows the annual averages for groups of five years (except 1990-1994), which smooths out much of the irregularity. Average annual increase in number of households according to the country of birth of the household reference person. Source: QLFS household dataset as table 2. Note: 1990-1994 includes only the differences between the years 1990, 1992 , 1993, 1994. At the beginning of the period, the annual increase in new households with a household reference person born in the UK greatly exceeded the number with a household reference person born outside the UK. By the end of the period, the reverse was the case. 78 % of new households in the last five years had an overseas-born head while the number of new households with a UK born head had fallen to 22 % of the total. 16. The number of new dwellings completed has averaged 180,000 a year since 1996, although in recent years this has fallen to 140,000 a year (DCLG 2015). This compares with an average additional household growth of around 170,000 since 1996. Had the number of dwellings completed been higher then it is likely that household formation would also have been higher as those living as ‘concealed households’ would have been more able to form their own new household. 17. Household formation is not a uniform process. Some immigrants may take longer to set up independent households than average. Immigrants have a lower propensity to form separate households because they tend to live in larger households (That is, their household representative rate (headship rate) tends to be low; Holmans 2013, table A3 p. 25). Immigrants from some origins favour multi-adult and multi-family households, with a larger than average household size, and fertility rates are generally higher. Some of the fast-growing immigrant populations in London have adapted to shortage of housing by increasing their level of overcrowding (Gordon 2014, p.48) presumably including dwellings with more than one household. We do not know what proportion of households headed by immigrants share the same dwelling. The new immigrants from Eastern Europe, mostly young people (initially) without family come from societies accustomed to small family and household norms. However many, at least to begin with, have been living in shared accommodation and boarding houses and therefore also have low headship rates. Published data on household size according to the country of birth (as opposed to ethnic origin) of the household reference person is scarce. All this makes it difficult to know exactly how the growth in the number of households headed by immigrants translates into demand for housing (Simpson and McDonald 2015). But the LFS data presented here give unequivocal, direct information on the proportion of households headed by immigrants, irrespective of the size of the household. http://www.migrationwatchuk.org/briefing-paper/7.17 for a discussion of the impact of immigration on London’s population). 19. In response to a parliamentary question (HL610) the ONS has calculated that 66 percent of the 1.96 million increase in households from the 2001 census to the 2011 census had a foreign-born household reference person and 34% had a UK-born household reference person (ONS letter March 2015). It was noted earlier that the 2001 and 2011 LFS data on country of birth were anomalous and give an implausibly high percent of foreign-born HRP. Instead, for comparison we have chosen the average of the LFS data from the neighbouring pair of years of 2000 -2010 and 2002-2012. That calculation gives 63% of household growth over the decade from households with an immigrant HRP and 37% from households with a UK-born HRP. That is a reasonable fit with the census data. 20. This paper does not deal with projections of future household creation arising from migration. We do not have enough information about household formation rates for immigrant populations to enable accurate projections to be made about its impact on housing demand. The latest household projections for England (DCLG 2015, discussed by Simpson and McDonald 2015] are disappointing in this regard. The ten- page report lacks detail and omits the variant projections presented in earlier projection volumes. Those used to include a zero-migration variant, which enabled an estimate to be made of the effect of future migration on household formation from the start date of the projection. The last report to do so, the interim projections based on 2008 (DCLG 2010, table 6), published in November 2010, estimated that 36% of housing demand up to 2033 would arise from net migration. But that assumed that net migration would only be 157,000 annually, whereas the actual average inflow from 2001 have been over 200,000 annually. It also estimated that household formation rate would run at 232,000 a year, rather than the 170,000 that has far occurred. Furthermore, that projection assumed that only 72 percent of household growth would come from population factors, not almost all of it according to the later projections and other work (DCLG 2015, Holmans 2014). For the same reasons, the projections given in a recent House of Commons paper (Heath 2014, p. 14) suggest that a rather modest 27.8% of additional households up to 2021/22 could be explained by net migration. But this projection also uses the 2011 interim household projection with the assumptions noted above, and furthermore a net annual migration to England of about 145,000, whereas the average over the last decade has been well over 200,000. The DCLG high migration scenario with net migration at 217,000 gave an estimate of 115,000 new households a year due to future migration. As it happens, the actual average annual increase in households with a household reference person born outside the UK had already reached 115,000 in 2010 - 2014 (Table 3, this paper). 21. In a report for the Town and Country Planning Association, Alan Holmans (2013) estimated that 240,000 to 245,000 additional homes would be required each year to meet newly arising demand and need, a similar estimate to that made by the DCLG (2007) in ‘Homes for the Future’ and by other analyses (e.g Jefferys et al. 2015). About 25 per cent of housing requirements would be concentrated in London, and 60 per cent in the four southern regions. 22. Projections that meet ‘demand and need’ must take into account ‘backlog need’ arising from inadequate levels of housing availability, of which the major component is the ‘concealed households’ mentioned earlier. ‘Backlog need’ was estimated to be two million in England in 2009 by Bramley (2010) and likely to diminish only slowly. The policy changes that promoted immigration from the late 1990s were never matched by increased housebuilding to meet the inevitable additional demand. New completions of housing have been in long-term decline for many years (Heath 2014). From about 200,000 around 1990, housing completions in England fell to about 130,000 in 2000-2001, rising to a transient peak of 170,000 in 2007-8 before falling to fewer than 120,000 in 2014 (140,000 for the UK as a whole). That is wholly inadequate to the demand driven by population growth. In the most recent period 2010-2014 new household formation with UK-born heads has been about 32,000. That is well within the level of recent housing construction, however low, although allowances must be made for ‘backlog need’ and replacement of demolished buildings. 23. The trends up to the present that have been demonstrated above show that there is a close connection between immigration and new household formation, and therefore demand for housing. In all the fierce controversies about how many dwellings to build, and where to build them, this crucial connection is rarely made. Commentators almost invariably insist that housing supply must be expanded to meet the needs of an expanding population. For the time being that is obviously true. But moderation of that expansion in the future through policies to reduce migration is rarely discussed. For example the possibility of moderating demand through restrictions on immigration features nowhere in the extensive recommendations made by KPMG for Shelter (Jefferys et al. 2015) in order to alleviate housing shortages. Unless there is a radical change in immigration polices and their effectiveness, or other unforeseen events, population growth, driven largely by immigration, will continue to be the driving force behind most new demand for housebuilding. The Labour Force Surveys used in this analysis were downloaded by kind permission of the UK Data Service. Valuable advice on the distinctions between the person and household level weighting, and other matters, is gratefully acknowledged. The UK Data Service has no responsibility whatever for the analysis and opinions expressed in this paper. Department for Communities and Local Government (2010). Household Projections, 2008 to 2033, England. London, Department of Communities and Local Government. Heath, Sarah (2014). Housing demand and need (England). Standard Note: SN06921. London, House of Commons Library. Gordon, Ian. (2014). Fitting a quart in a pint pot? Development, displacement and/or densification in the London region. Migration and London's Growth. Ed. Ben Kochan. London, LSE London: 41 - 55. Kaufmann, Eric and Gareth Harris (2014). Changing places. Mapping the white British response to ethnic change. London, Demos. ONS (2014). Households and Household Composition in England and Wales, 2001-11. 29 May 2014. London, Office for National Statistics. Simpson, Ludi and Neil McDonald (2015). "Making sense of the new English household projections." Town and Country Planning (April 2015): 175 - 182. Whitehead, Christine (2014). The impact of migration on London's housing. Migration and London's growth. ed. Ben Kochan. London, LSE London: 143 - 154. For the 2011 census a household was defined as : ‘one person living alone; or a group of people (not necessarily related) living at the same address who share cooking facilities and share a living room or sitting room or dining area’. Calculations of natural increase are easier for England and Wales, which comprises 89% of the population of the UK. The need to refer to data for England and Wales, or England alone, as a surrogate for UK-wide data reflects the weakness of our national statistics and will be a recurrent feature of this paper. The relevant population here is the household population; that part of the population living in private households, not in communal establishments of various kinds. For example in 2011 the total population of England and Wales was 56.1 million while the household population was 55.1 million, the latter being almost 2 percent smaller than the total population. Non-responders are not included in the person-level weighting. Accordingly a two-person household with a non-responder is treated as a single-person household. That gives such households a higher weight, changing the ratio between households and population and inflating the estimate of the overall number of households. The Head of Household (HoH), or the Household Reference Person (HRP in more modern usage) is the individual that is taken to represent the household for statistical purposes in censuses and surveys. The definition of the household reference person has changed over time from being the eldest male within a household to the eldest person within a household.. The number of households recorded by the QLFS differs by up to 2% from the number recorded in the census of the same year. Not all persons living in a household with a reference person born outside the UK will themselves have been born outside the UK. Many children will not be, and some adults. Likewise there will be persons born outside the UK who live in households with a UK-born reference person. The LFS cannot tell us how many. In 2014 13% of all UK (household) persons had been born outside the UK compared with 14% of all heads of household. That makes a ratio of 2.21 immigrants for every immigrant-headed household compared with an average ratio of 2.38. The household representative (or headship) rate is the proportion of adult individuals living in households in any defined group who are heads of household or household representative persons. The lower the rate, the larger the average household size in that group. In London, while new arrivals in 2001-11 from rich countries did not alter local densities of occupation, average occupation per room of new immigrants from poor countries was about 2.5 times that of established residents. London boroughs with a high proportion of immigrants such as Brent (55%), Newham (54%), Ealing (48%), Harrow (45%) Tower Hamlets (43%) all have the highest levels of household density, with between 5 and 10 percent of households containing six or more persons, along with other towns such as Luton, Slough, Bradford and Leicester with high concentrations of population of South Asian origin (ONS 2012, table 4; ONS 2014, table 6).